Bracco Italiano dog breed has been popular since the Renaissance. The breed (which is also called the Italian Pointer) was originally used to drive game, primarily birds, into nets. However, with changing times the breed was able to change, too, and today is used to find, point, and flush birds and then retrieve them. There are two types of Bracco Italiano. One body type is heavier and more houndlike and predominantly white and brown. The other is lighter-bodied, more pointerlike, and is white and orange. The Italian Kennel Club recognizes both types. The Bracco Italiano breed stands 21 to 26.5 inches tall and weighs between 60 and 90 pounds, with females smaller than males. The head is large but narrow, with long, low-set ears, deep flews, and loose skin on the head and neck. The chest is broad and deep, the body is longer than it is tall, and the tail is long. The coat is short. The Bracco Italiano dog breed is easy to groom; a twice weekly brushing will keep her shiny. Her heavy ears should be cleaned regularly, though, to keep them healthy. The Bracco Italiano is usually calm in the house but requires vigorous daily exercise. She will enjoy walks, play sessions, and catch-and-fetch games. If she doesn’t get enough exercise, she will amuse herself and can be a destructive chewer. Training should begin early. Although the breed is intelligent and sensitive, these dogs also have a touch of independence and stubbornness. Training should be firm and structured but should also be fun. Avoid too much repetition and heavyhanded training. Their affectionate nature makes them wonderful therapy dogs, and their scenting abilities make them superb tracking dogs. 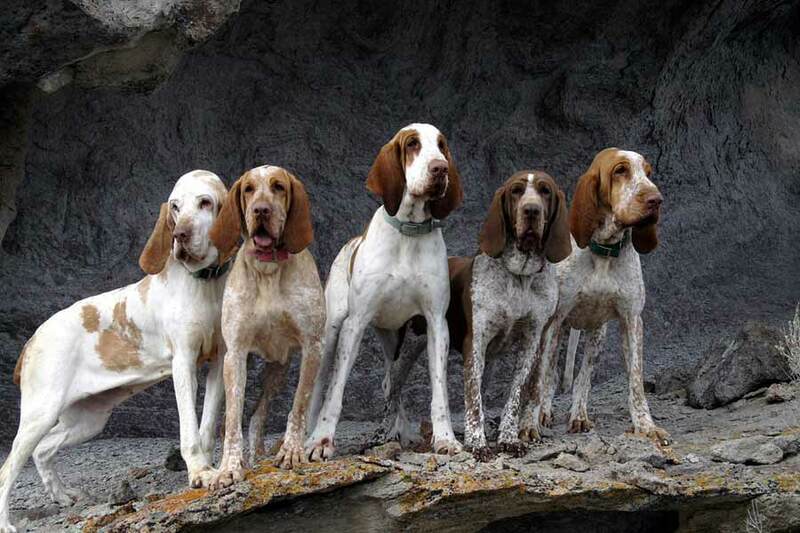 The Bracco Italiano is still used as a hunting dog in Italy, although many in the U.S. are family pets. They do best in homes where people will be involved with the dogs; they are not good backyard dogs. The breed is great with children but should be supervised with smaller pets. Health concerns include bloat, torsion, and hip dysplasia. Share your Bracco Italiano story. Note: Upload only Bracco Italiano picture or your picture with Bracco Italiano below - spammer's ip may be blocked.